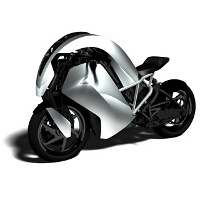 Electric vehicles seem to be all the rage these days, so you might be interested to ride into the sunset with the Agility Saietta R Bike – a cool looking two-wheeler that looks as though it comes from the future. Of course, the £13,570 price tag is not going to make it appealing to everybody at first glance, but hear me out as I list down what’s so great about this. First of all, you need not worry about traffic jams since you can always zip yourself around town on this, squeezing between cars to get from point A to point B within the fastest time possible. Apart from that, you don’t have to cram yourself into public transport like you’re part of a sardine tin, and best of all is, the spare seat behind is perfect for you to pick up chicks (if you’re single, of course) as it looks totally hot. With the Saietta R’s electric motor in action, all the bulk associated with how a standard bike should look like has been removed, and hence the shape and model have evolved to resemble something from the future. This lightweight and environmentally-friendly dream ride might not glow like something out of Tron, but it will still turn heads around and eyes green as you cruise down the street on this.